I know I have these posted somewhere in my blog last year but I figured I need to keep these labeled correctly so I can quickly access them when I need them. This is a project I started but the hubster (the carpenter/artist/painter, etc.) extraordinaire finished!! Thank goodness for him and his trusty paint sprayer otherwise it would have taken me twice as long to paint this gem! 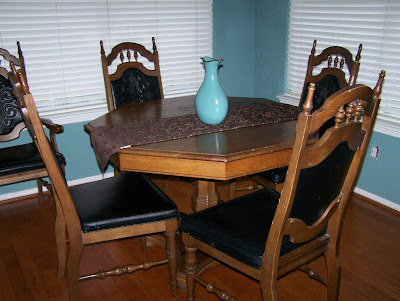 We got this late 70's solid wood dinette set from a lady who was moving- FREE!! That's the best kind huh? 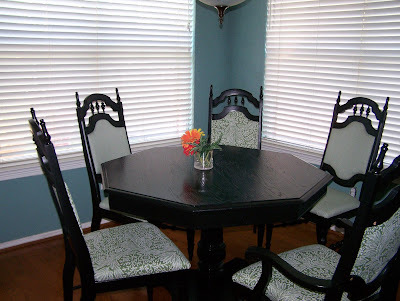 So after much mulling around, I decided I wanted it black with the chairs in some type of snazzy green fabric. I didn't want the fabric all to match so off to Joann's Fabric we went. I told hubby, who again, has EXTREMELY good taste for a man(thanks to being raised with SEVEN sisters), my desires and off he went in search of snazzy, cheap fabric!! And Viola!! He found it! I can't remember how many yards we bought but we had a little left over. I bought some black paint in semi gloss and he used his spray gun to paint them. Then he added a coat of polyacrylic to the table top.This is the result. Aren't they soo chic?? I love them and we get compliments all the time. I think we spent about $60 on the whole project! Someone's trash turned into our family's treasure! What treasures will you find today? Looks awesome! I love that fabric with the black! He really did do a wonderful job! I think you made the best choice painting it black!! 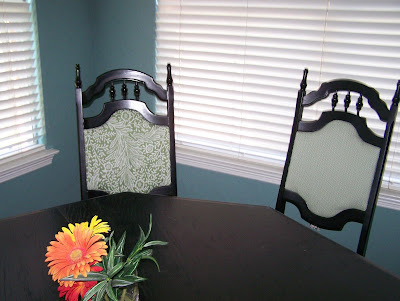 The fabric on the chairs is gorgeous!